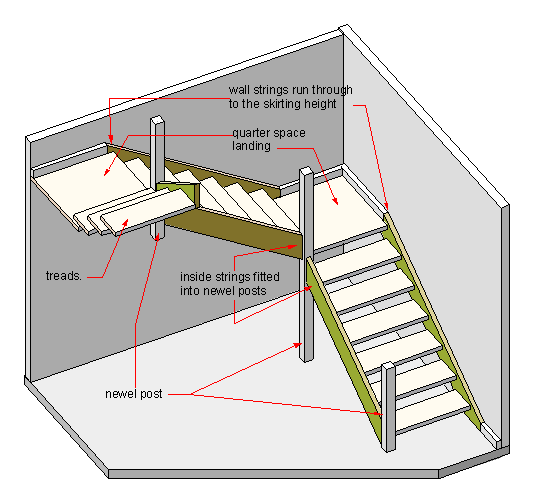 More on building stairs in timber, closed strings and landings. If you have landed here from a search engine, check out the links on the for more on stair design and stair setting out etc. Building stairs - Simple stairs with closed strings, half space landing and open risers. In the above sketch I have shown the riser open. It is just to show the basics of building stairs with landing and newel posts. For the most part in this type of stair well the wall string is a full one and very often the outside one is cut and mitred as in the photo below. A couple of points from previous pages, but well worth repeating. As far as the height goes and getting your individual step rise, the steps and the landings are all the same. Just treat the landings as treads, just a bit longer and a bit thicker. Building stairs - A solid turned timber newel post with the handrail terminating in a handrail scroll. The outside string to the newel is known as a cut and mitred string. Photo thanks to "Gracey" and Morguefile. In the sketch above you can see that there are a few different types of newel posts but to a certain extent they perform the same functions. Newel posts are a strong way to join the strings at a change of direction. When securely fixed to the strings they provide a strong support for the handrails. When carried down to the floor they can provide support for the landing,stair itself and for a wall or panelling under the stairs. There are also many examples of stairs that manage quite well without newel posts, using the balusters alone and quite possibly a wreathed string. There is an excellent example of one of these on my intro to stairs page. 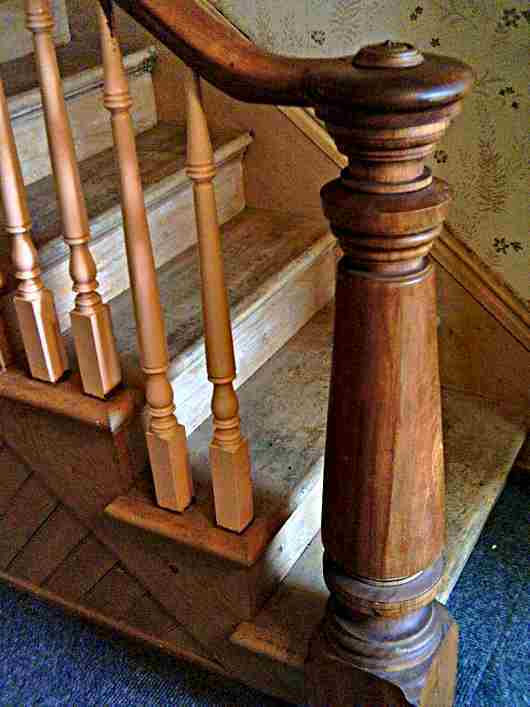 Newel posts are a tried and tested way of building stairs in the traditional way. Notice that in the turned example in the photo, that where the joint is made to the string then the post is left square to make the joint construction easier. This is fairly typical as it is far easier to fit to a square section than a round one. In this type of internal stair the strings are router out and the only way to do it is with either some very sophisticated machinery or a very simple home mad router jig. Here's a section on one of my router pages for making a very simple but efficient router jig. Here is an expanded version for the stair jig alone. Building stairs - The bottom joint between the new post and the outside string. As you can see from the sketch, the string is fixed to the post with a stub (not going all the way through) mortise and tenon joint. The joint is glued and dowelled. The dowels are on the inside where they will not be seen. The stair jig is used once again to router out the newel post as shown for the treads and risers. The treads and risers in their turn are glued and wedged, so you can see that this is a very strong method of fixing the newels posts. The joint at the landing. These two sketches are just about self explanatory. Once again I could make the comment that stairs built like this in the traditional way are tremendously strong. I have seen quite a few modern stairs that use far weaker joint systems. If I was intending to buy one of these kit type stairs I would be asking about how it is constructed, before parting with any cash.